Combined with the mobile Bluetooth Voyager Legend headset from Plantronics, the Gigaset S820A cordless DECT phone offers a rich set of features including an answering machine, a large touchscreen and innovative call management features. With the user-friendly, icon-driven interface, you can select up to six of your most frequently used functions to display on the home screen for quicker access. Call management features include time-based call silencing, number blocking, call forwarding and voicemail handling. The answer phone can record up to 55 minutes of voicemails, and you can pick up where you left off thanks to lists of recent missed, outgoing or incoming calls. The included Bluetooth headset facilitates wireless hands-free communication, while the battery provides a talk time of up to 20 hours. 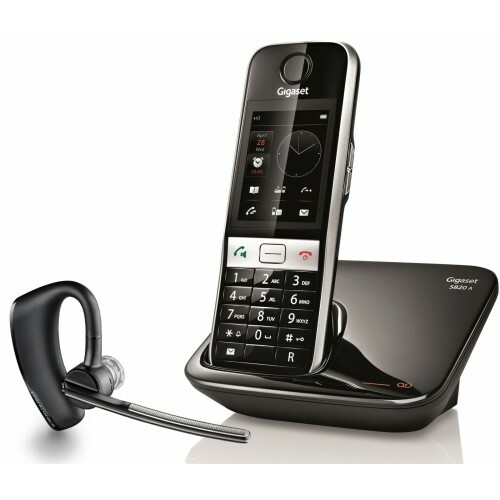 The Gigaset S820A and wireless headset is an excellent choice for both home and business use.